Pretty doesn’t last. But the naked mole rat abides. The nearly blind subterranean rodent with wrinkly, pink skin and sparse hair looks disturbingly like a big toe with tusks. But it can live for 30 years — 10 times longer than its rodent cousins — and shows remarkable resistance to tumors. Those are traits that tend to attract the attention of molecular biologists, among other mortals. Who wouldn’t love to find ways to slow down death, and maybe cure a few intractable diseases along the way? That’s what motivated Vera Gorbunova and Andrei Seluanov at the University of Rochester, who keep a colony of the highly sociable rats in their upstate New York laboratory. 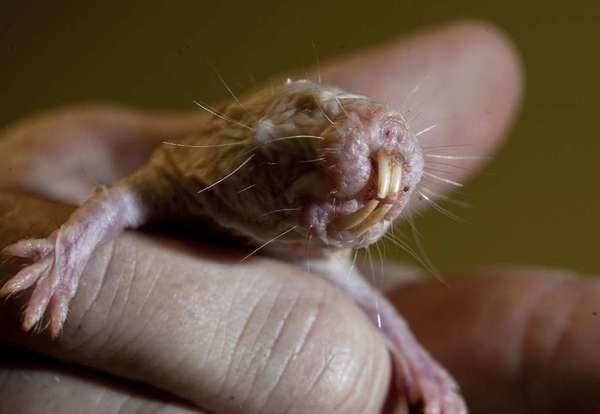 “Every time we look at the naked mole rat, there’s something unexpected and something that could be potentially useful to humans,” Gorbunova said. Earlier this year, the husband-and-wife research team identified an unusually massive sugar-like molecule that appears to contribute to the rats’ notorious resistance to tumors. Now they have identified a peculiar chemical behavior of the RNA inside the naked mole rat’s ribosomes that seems to give these cellular protein factories the kind of precision that would be the envy of German automotive engineers. That ability to carry out genetic orders, known as “translational fidelity,” seems to be linked to longevity, according to a study they published this week in the journal Proceedings of the National Academy of Sciences. Ribosomes are the khaki pants of the vertebrate world: ubiquitous, mundane, reliable. They are, in the lexicon of science, “highly conserved.” Evolution has handed them down as virtually identical, with just three RNA molecules. Except, it looked like the naked mole rat had four. It turned out that one RNA molecule (unimaginatively named 28S) was splitting and jettisoning a small fragment, like a computer code editing itself. “When we saw the first time that ribosomal RNA split, people did not believe their eyes,” Gorbunova said. Such cleavage has been found in salmonella, protozoa, a worm and several arthropods. But only one other mammal shows the trait — the tuco-tuco, a South American rodent that likewise lives underground, but has fur, sight and a short lifespan. The Rochester-led team, which also included geneticists from Albert Einstein College of Medicine in New York, wondered how such RNA cleavage affected ribosome function. When the researchers looked at the rate at which the RNA translated genetic code, though, it was no different from that of other rats. What was different was its precision. Naked mole rat fibroblasts had a quarter the rate of errors – incorporating the wrong amino acids – than those of the shorter-lived mice, the researchers found. Errors lead to “junk,” and “junk” leads to clogs, and clogs have been implicated in numerous age-related diseases, including Alzheimer’s disease. Getting protein right in the first place seems to matter, in other words. “Here we see that we have an animal that naturally evolved a long lifespan, and it has more accurate translation, so it really reinforces the idea that accuracy of protein translation is important,” Gorbunova said. The Rochester team hopes the naked mole rat findings will lead to drugs that can affect such protein production. They will further test their findings, perhaps by inducing a split in the ribosomal RNA of mice, to see if it has a similar effect on cell longevity in the laboratory. Trying such experiments on live animals, with so many thousands of RNA molecules, would be next to impossible with current technology. And Gorbunova begs to differ with those who might see this as ugly work.